I have to admit that I’m being a bit of a hypocrite for making a widget when I hardly use any of the widgets I installed. But hey, it’s leopard print. It’s cute. It’s basically a RSS feed reader. Run this widget and presto! 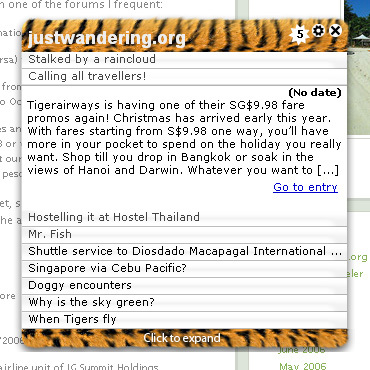 You can check and read any updates on justwandering.org. The catch: You have to switch to Opera 9. Sneaky, eh? Oooooo…cool. Does it come in other prints? LoL. I do like your leopard print, though. It’s snazzy. Singapore via Cebu Pacific! – Updated!